Upon arriving at the giving tree you are greeted by Sora, who looks after the giving tree. There are various things found at this page, which will be explained in this guide. Let’s first go over the Scoreboard! This is what the scoreboard looks like to all players. When you give an item to the giving tree, you are potentially getting your town a point on the board. You are not automatically given this point until someone else picks up your item. Currently, the scoreboard does nothing and may potentially change in the future! So… How do you give to the tree? Well.. here we go! There are two possible ways to give items at the tree. Here we can see them. One is in the form of currency, and the other is in the form of items. By selecting one or the other, it can give a pop up. You also have the choice of giving anonymously or not, all up to you! Let’s go over currency first! So be sure to click on Give Currency! As a note when donating FurCash, there is a minimum donation of 25FC otherwise you’ll get this nice, red notification! 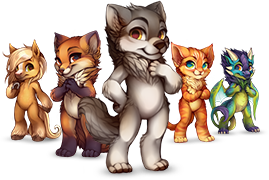 There is currently no minimum when donating FurDollars. 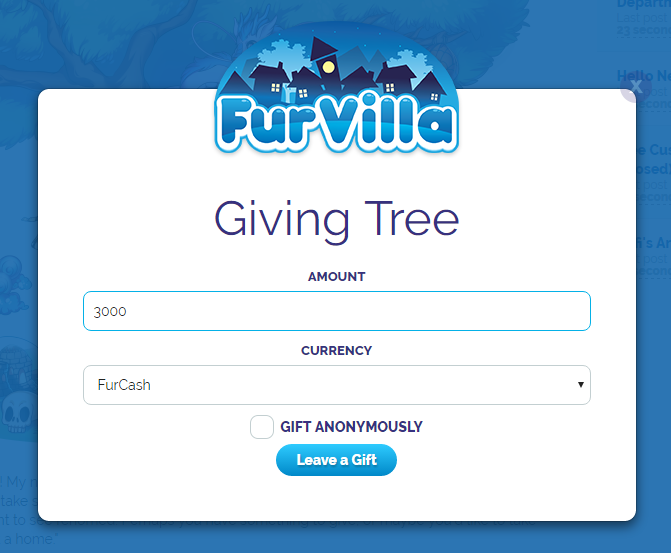 So just type in the amount you want to donate and wether you want it as FurCash or FurDollars. When entering the numbers no commas should be used otherwise it won't work. Second, let's go over items! then something like this should pop up! You can select how many of which item you wish to give. Taking from the tree is very simple..
Just simply click on Take and be quick before someone else takes that item you wanted. Your inbox is what is In your Box. Or well, in your inventory. This is what you have taken from the tree and who you got it from. If it was left by an anonymous person it'll just show Anonymous, just like in the picture above. 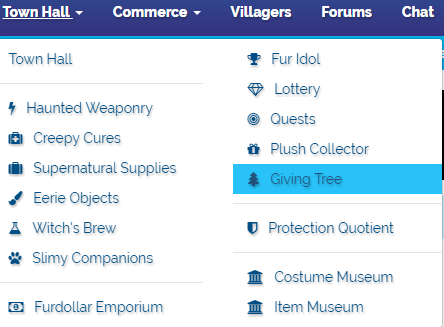 These are a list of users who have taken any gifts you left at the tree and it also shows what they have taken.